Create your signature style in a new adventure with paper dolls. 16 paper doll projects to add to some fashion flair and inspiration to your artwork. 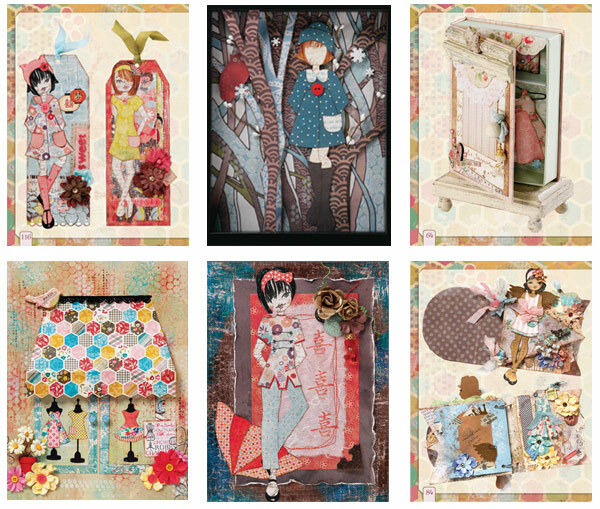 Let your inner child come out and play with paper dolls in Collage Couture Studio Paper Dolls. Inside this collage book, meet five fashion-forwards dolls and dress them up in their distinctive style or create your own. Take your paper dolls on a journey around the world and create each stop along the trip. Utilize mixed-media techniques with crackle paint, doilies, stamps, ribbons and more to create the backgrounds and settings to take your dolls to visit Paris, the gardens of Japan, or a dress shop in London. Not only can you re-live a fairy tale through your paper dolls but you can add these ideas and techniques to all mixed-media art. Use these fashionista girls to add some flair to your art journals. Create charming banners and paper doll chains. Design chic tags as substitute for a card, or hang one from a gift bag containing a special treasure. Learn how to do all of these techniques as you embark on a new creative journey—fashionably of course! Julie is the author of North Light's Collage Couture and a papercrafter/mixed-media artist who loves making fashion forward creations. Prima Marketing Inc. has launched a line of stamps called Prima Couture by Julie Nutting. Julie is an educator with Prima tours internationally on behalf of the company. Julie has also been working with Leaky Shed Studios on a chipboard line. Chapter 5: Let’s Play Dress Up! Chapter 6: Are You Ready to Go on a Journey?